In-Stock Window Badges: Quick Ship! Choose from our Executive Molded Plastic Window Badges, rugged Laminated Vinyl Badges or quick shipping Stock Badges. Both styles are easy to personalize. 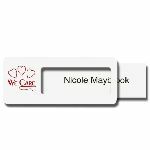 You print your employee names using your laser or inkjet printer and just slide them into the window with a protective clear cover. If you need a window badge but want the most durable choice, you need to order our Laminated Window Badges. Your logo will never fade or wear off! 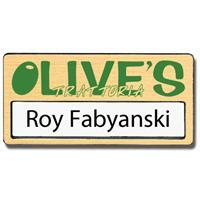 These Molded Plastic Window Name Badges have the look of an expensive metal badge at a more reasonable price. 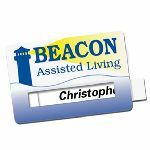 Need window name badges fast? The badges in this category can be shipped out in a couple of days...sometimes even next day!